One of the problems with being a family of educators is that our travel times are pretty well set in stone, so with Devon and Erika visiting, we found ourselves headed to Paris in June. Many people will tell you Paris anytime of year is a good idea, but I usually try to stay away in summer. Not only are the tourists out in hordes, but those beautiful baroque buildings and chic Paris fashions are just not as interesting or fun to me when I’m sweating! It can get very hot. To make matters worse, we were planning on taking a cooking lesson. Oh the agony….NOT! We found the best English-language cooking lessons and loved every minute of it. That’s the thing with family travel, you get to do fun things like bake! That’s right! 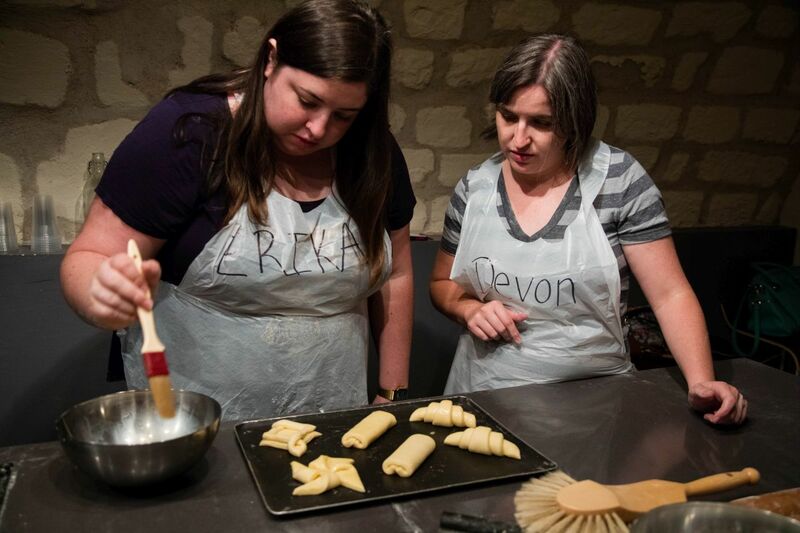 The reason we all wanted to go to Paris is this was the summer of really learning how to cook, or in this case bake local specialties and what is a more iconic French food than the coveted croissant? Devon and Erika were completely on board. 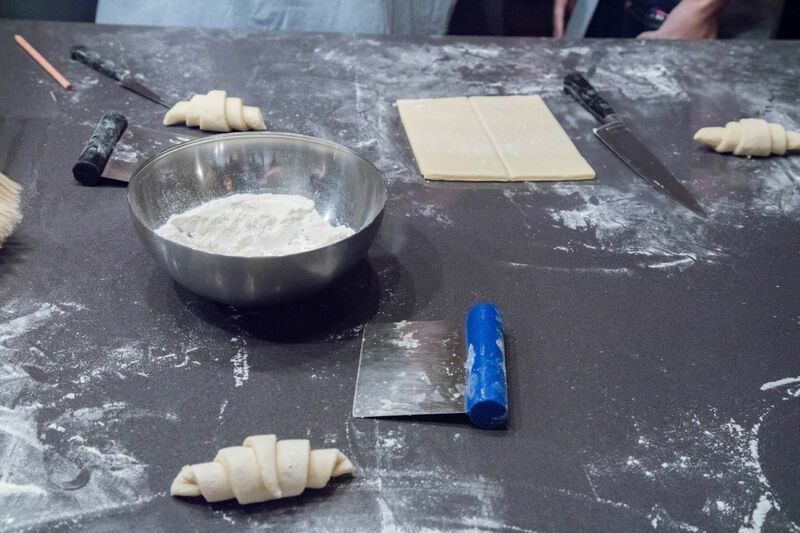 We all love watching cooking shows, so we’ve seen them attempt the dough for croissants. 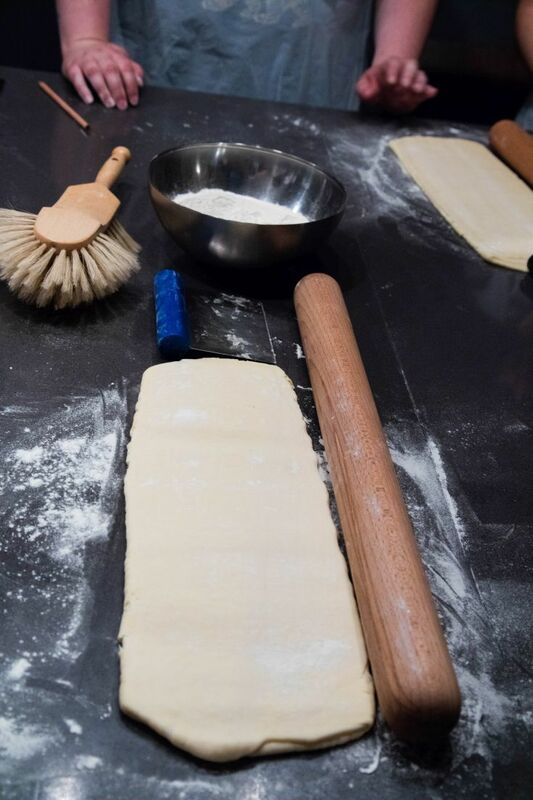 It’s a laminated dough, which means that you roll, add butter, chill, and repeat. This is what makes those delectable, buttery layers that make you want to overload on French breakfast pastries while you can…but, it’s intimidating. There are definitely some recipes, that you can read and replicate with no problems, but this was a classic bake and we really wanted to make sure we learned the correct way. Our day started early, and the sun was already up and brightly shining at nine o’clock. We dropped Jim off at La Cuisine Paris where he had opted to learn how to make French sauces for his cooking lesson instead of having all four of us struggle with the pastry. That gave the three of us another 30 minutes to stroll around while waiting for our class to begin. The school is located only a couple of city blocks from Notre Dame, so we walked that way and were happy to capture the golden morning light on the cathedral. There were already six or seven huge bus tour groups listening to their lectures, following the flying flags, and queuing up for the climb to the top of the bell tower. So, side note, if you want to do Notre Dame in summer, skip breakfast and get their early, early. Back at the school, we waited for the other participants to arrive and then Guillaume, our chef and teacher, picked us up and took us down into the basement where the kitchen was set up and waiting for us. 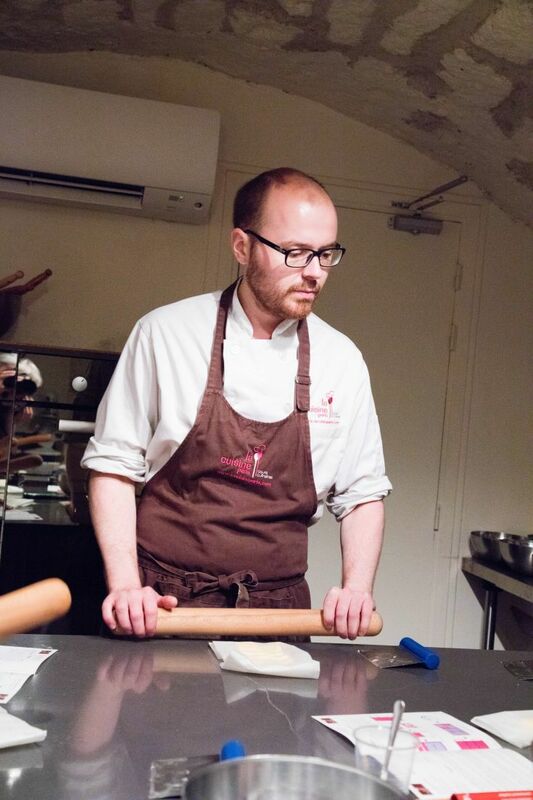 Each class at La Cuisine Paris allows eight participants, so if you are going with someone you automatically have your partner, but if not, you’ll be paired up with someone. No matter what, though, in our experience everyone who goes to a foreign country and takes cooking lessons all share your love for food and learning, so you’ll definitely make a new friend. Guillaume didn’t waste time. He quickly made the round of introductions and then explained to us that we needed to get moving so that we would have time to do everything in his plans. From the moment we started until the very end of the lesson, Guillaume just kept me sort of chuckling under my breath and enjoying his French-ness. Again, I watch a lot of cooking TV and the stereotypical French chef is very meticulous, very talented, and very set in his or her ways. I think Guillaume really fit into this character box as well, but of course he had his own twist on jokes and his own particular ways of doing things which I came to appreciate more and more as the lesson progressed. After introductions we got right into it. Before we knew it, we had a pile of flour right on the stainless steel countertop, and we were hand mixing in the live yeast. Of course I’d seen this done, but the idea of not using a mixing bowl is just so “chef-fy” to me. 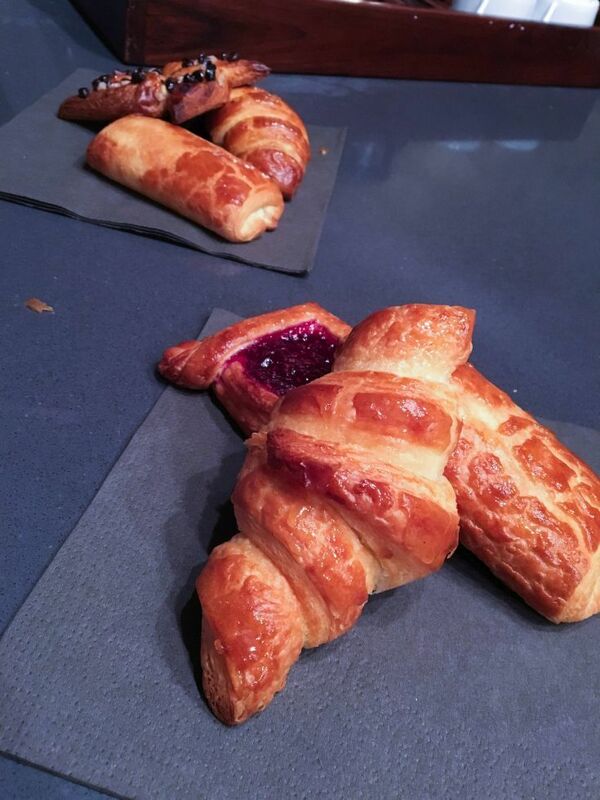 Even though we were given a well-illustrated, well-written croissant recipe, we didn’t have much time to read it, because Guillaume walked us through each step, making sure we stopped when we’d finished each one, not allowing us to overdo anything. Our dough mixed, we rolled it out to particular dimensions, learned how to fold it, and put it in the fridge. 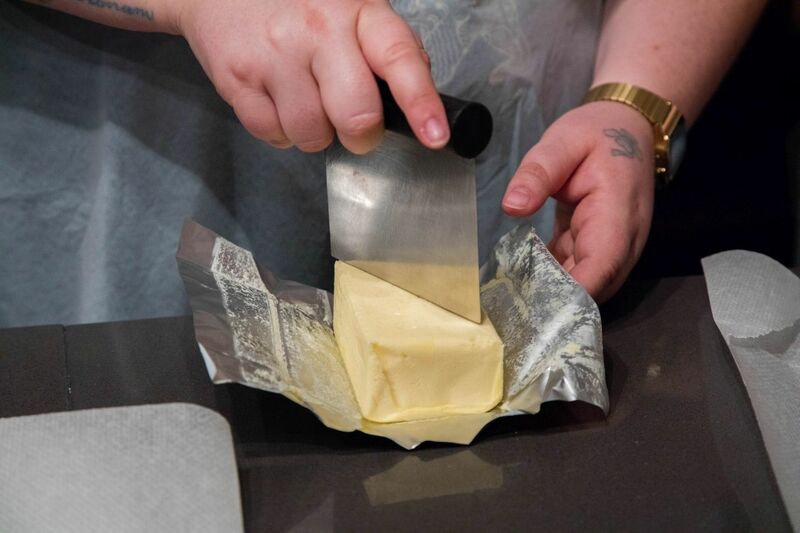 Later we would take it out, put in another layer of butter with 80% fat and roll and fold it again. However, since the dough needs a good 24 hours, for the actual baking of our pastries we used dough that was already made for us. In between buttering and rolling, we learned how to make the vanilla cream that we would bake into some of our pastries. It didn’t take long, and since we each needed only a small amount, we passed the pot around for each person to do a step. Again Guillaume peppered in hints and help throughout the process, from how to use the entire vanilla pod, to how to whisk the mixture. This was the main reason we signed up for a class; you just don’t get these personal touches from a written recipe. 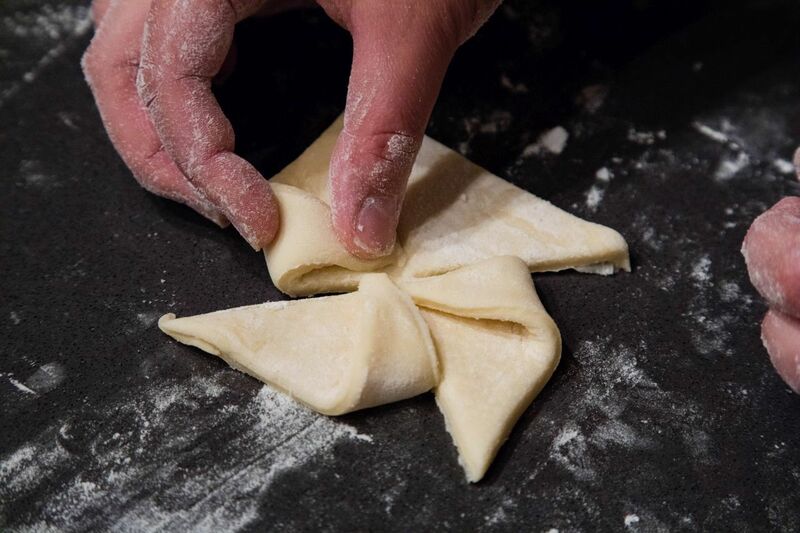 The final step was learning the very explicit, mathematical way to cut the dough to spiral the croissants. For those of us that struggled with math, this was a bit of an excercise, but again by taking it step by step, we were all successful. We also learned how to cut and fold the dough for pain au chocolat as well as a basket-shaped danish. 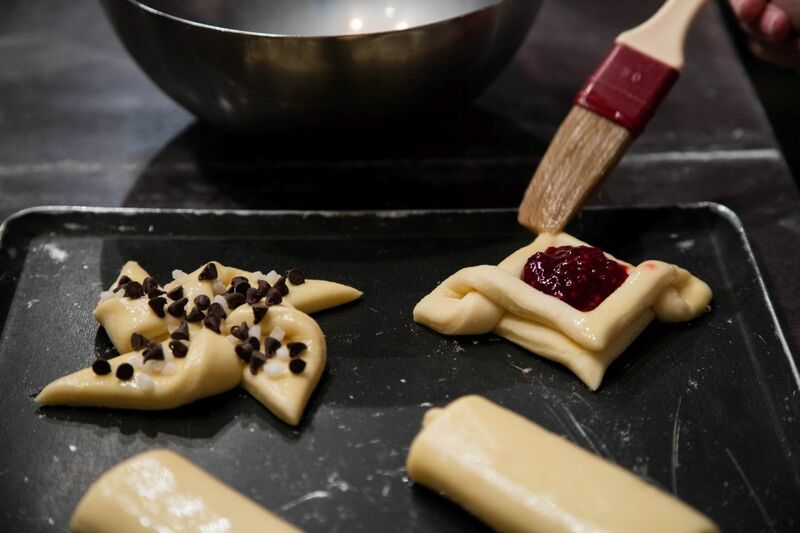 We finished preparing our pastries and put them in the industrial stack oven to bake. The smell was amazing! When all was finished, the pastries came out, were put on the plates and Guillaume served us some tea and coffee to enjoy them. While we marveled at our success, he passed out maps of the area and gave us some tips on where to have some great French food and where to buy cooking supplies and French products. This was one of the biggest bonuses from attending the workshop, and that very afternoon we headed to some of his recommendations. 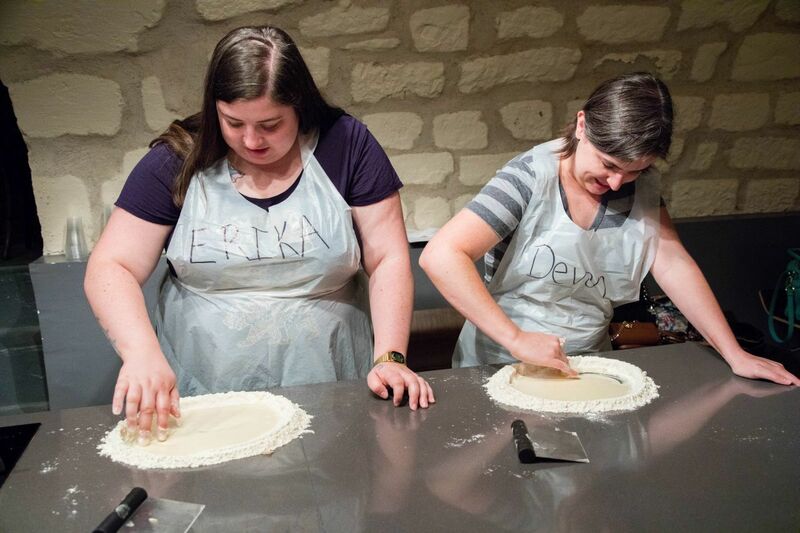 If you are looking for something very French to do in Paris, and you love French food, take a look at La Cuisine Paris for their cooking classes. Our friend Kerri, from Beer and Croissants, also wrote about her experience and she’s been twice! If you go, we might see you there, because we are definitely going back! I have to learn how to make those macarons! We payed our way at La Cuisine Paris and found it to be travel money very well spent. Check out their website and book a lesson or two on your next trip to Paris! Where to stay: Ibis Budget Hotel. These hotels are spartan: all they have is a bed and a bathroom, but what more do you need. There are much nicer hotels, quainter ones, and of course more romantic ones, but we always spend a lot of money living it up in La Belle Paris, so this is one way to shave costs. A whole class on croissants! They do look tasty. Rhonda, I can’t even tell you how tasty….yum! I’m a huge fan of La Cuisine Paris! Jane has created a magnificent cooking school that makes learning French cuisine fun, easy and truly delicious. All the chefs of the various classes I’ve taken have fostered a sense of bonhomie that’s contagious! Kyle, I couldn’t agree more. We can’t wait to take another lesson. I gave myself a challenge a few years ago to make true croissants from scratch – it was definitely an experience and yielded wonderful results, but I’ve since come up with a version to do in my bread machine which cuts the process down to a more manageable few hours…the croissants aren’t at the same level, of course, but they still turn out good enough and are more practical to make! Lisa, I love taking a recipe and finding a way to make it manageable. Great idea!